Rashes are an incredibly common reason for small children to go to the doctor. Most of the time if your child has good overall health and doesn’t exhibit any symptoms other than the rash, it is fine to observe his rash for several days before contacting the doctor. In many cases, the rash will simply disappear over time without any need for treatment. Rash around toddlers’ mouth are usually mild and can be treated and prevented by simple measures. Warnings: You should visit the doctor if your child’s rash is joined by other symptoms such as vomiting, breathing difficulties, high fever or a reduction in overall health accompanied by behavioral changes. In this case it is important to visit the doctor as it can be challenging to describe a rash over the phone. It is also important to remember that a particular type of rash may have multiple possible causes. Because of this the doctor will examine the rash, where it is located and the size and quantity of the marks. He will also ask how long the rash has been there for and whether it itches. Drool rash is when your toddler experiences irritation and redness on his face due to excessive drool and it most commonly occurs on the face. Most babies will have drool rash at some point or another and the most common time for this to happen is while teething. It is caused by the constant moisture affecting sensitive skin when it is rubbed on soft surfaces (such as pillows or shoulders) due to the friction and irritation. In some cases drool rash will become infected leading to infant impetigo which is a contagious bacterial infection indicated by honey or yellow colored crusting on the rash’s surface and possible blistering. Treatment: In most cases, drool rash is not serious and won’t require additional treatment from what you can provide yourself at home. One of the best treatments (and preventions) is to apply an antibacterial barrier before night. Another choice is to gently clean the area using soap and water or witch hazel and then applying a lubricant (lanolin, Lansinoh, or petroleum jelly). Never rely solely on a lubricant as it may trap bacteria inside. Prevention: The best way to prevent drool rash is to aim to keep your child dry as much as you can. By using a bib you can stop the rash from spreading to his chest. Always pat your toddler’s face dry using a clean cloth and be sure not to wipe or rub. Another option is to place some sort of absorbent material underneath your child’s head at night. Oral thrush is one of the most common causes of a rash around a toddler’s mouth and this is especially true in infants under six months of age. Oral thrush occurs when the yeast Candida albicans overgrows. This yeast naturally occurs within the digestive tract and mouth but the immune system usually controls its growth. As infants don’t have a fully developed immune system yet, oral thrush is more common in them. The risk of oral thrush can increase after taking certain antibiotics or if your child has lung disease or asthma. Symptoms: In most cases the symptoms of oral thrush in a baby include cracked skin on the corners of the mouth. He might also have thick, white patches which resemble cottage cheese on his tongue, inside cheeks, and lips. When you attempt to scrape off the white patches, you will notice red tissue which bleeds easily. The white patches can’t be wiped away and can increase in number. Some babies with oral thrush won’t experience any discomfort while others will be sore and choose not to eat. Treatments: Most of the time that an infant has oral thrush it will go away on its own within one or two weeks. If the thrush gets in the way of your child eating or lasts over two weeks, you should take him to the doctor. He will probably prescribe a solution of an antifungal nature which can reduce discomfort and eliminate the white patches. If your child is old enough for solid foods, his doctor may also recommend giving him yogurt that contains lactobacilli which will increase his levels of beneficial bacteria, allowing his body to naturally fight the yeast levels. If your toddler regularly develops oral thrush, this can indicate another health concern. Hand, foot and mouth disease causes sores around the mouth as well as on the feet and hands. It will also occasionally affect the legs and buttocks. Although the sores can be painful, the illness won’t usually last for more than a week. It most commonly occurs in children and especially during the fall and summer. Causes: Hand, foot and mouth disease is the effect of the enterovirus which can easily spread via sneezing or coughing. It can also spread via infected stools and because of these factors it will frequently affect a community. In most cases it will have an incubation period of between three and six days which is the amount of time it takes for a person to display symptoms of hand, foot and mouth disease. Symptoms: The initial symptoms of hand, foot and mouth disease include tiredness, a sore throat or a fever ranging from 101 to 103 Fahrenheit (38 to 39 Celsius). After one or two days, blisters and/or sores will start appearing on the feet, hands, mouth and possibly the buttocks. Sometimes a rash will precede the blisters and the blisters can also break open and then crust over. Most of the time the blisters will go away within about a week. In some cases there will be almost no symptoms of hand, foot and mouth disease. Treatments: Doctors will diagnose hand, foot and mouth disease by examining the blisters and sores and will not usually need to prescribe treatment. Instead they will recommend relieving your child’s symptoms by offering cool fluids to reduce the sore throat. You should also avoid feeding him spicy or acidic foods and beverages as they can increase the pain associated with mouth sores. You can give your child ibuprofen or acetaminophen for fever and pain but never aspirin. Prevent the spread of the disease by keeping your child away from other children and washing your hands often. Impetigo is an infection of the skin that will initially appear as red, itchy sores resembling blisters but eventually become honey-colored crusts. It is most common in young children who scratch existing sores or rashes. 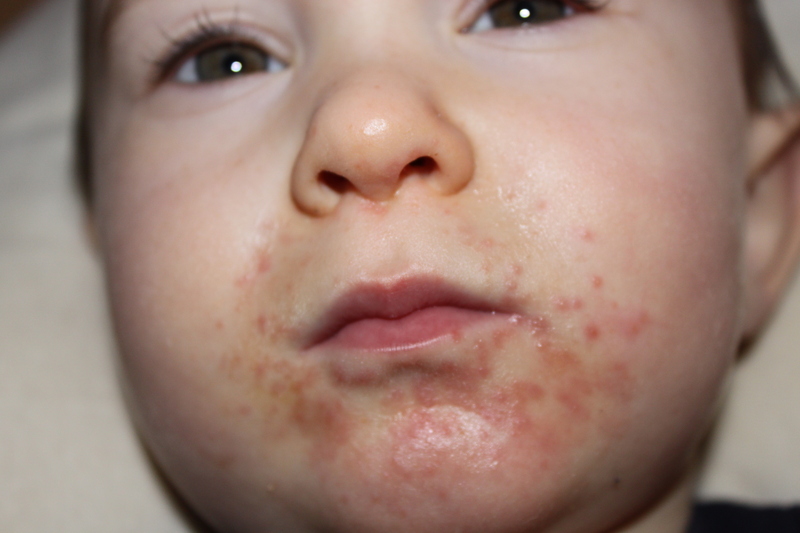 Impetigo is treated with antibiotics. Cold sores appear as purple or red sores on the lips or their outer edges. These are the result of sharing utensils with or kissing infected adults. Chickenpox is usually rare in infants as they are still protected by their mothers’ antibodies. The symptoms of this condition include blisters or sores around the mouth as well as other areas of the body. Strep throat is indicated by a red or sore throat and white patches on the throat or tonsils in addition to a rash on other areas of the body.